We decided to have the scenic route back and stopped by our old home (from when I was working at the BBC in Leeds) at Addingham, near Ilkley. It looked a lot smaller than we remembered it! Strange. Gorgeous countryside though and the sun shone. So, not a bad day out in the end - if a mite expensive. I was very saddened on returning from vacation to receive the news of the death of Jay Oliver, who died from complications following a minor operation in Florida. 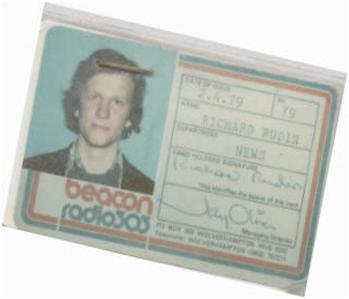 Jay was the first Managing Director of Beacon Broadcasting (Beacon Radio) in Wolverhampton, which went on air in April 1976 – the last of the original (just!) 19 Independent Local Radio (ILR) stations in the UK. The American was a big man, with a personality to match. Not content with 'just' being Managing Director, he insisted on having his own on-air slot –and he didn't need asking twice to voice commercials! You see, he just loved radio overall; I think he loved every part of it and, with Programme Director – the late Allen Mackenzie – hired highly talented staff in every field, from engineering (including 'the world's nicest man' Bruce Warburton), to presenters, to sales, to news (a phenomenal team until my arrival!). I was proud and delighted that my first pro' job in radio, at the tender age of just 21 (and only five and a half years after leaving school) was on this station, as I had been a 'fan' of it since its opening day (see my station staff card, possibly the last to be signed by Jay and dated I think after my probationary period! I've certainly a great hair-cut for radio there!). Beacon was launched in just about the worst possible economic and political circumstances – the Labour government was totally hostile to the concept of commercial radio at all, had fought against it tooth and nail inside and outside Parliament. Beacon was the only applicant for the Wolverhampton/Black Country franchise. No wonder. The country was near bankruptcy, having to call in the International Monetary Fund (IMF) – normally used for benighted and impoverished 'developing' countries. Britain was dominated by industrial strife, rising unemployment and huge inflation (exceeding 25% at one point – yes, young readers, that's 25%, not the 5% that everyone is getting so excited about now!). Several of the early stations (from 1973) had nearly gone bust already – Dickie Attenborough, chairman of Capital Radio, had to offer his private art-work as security to the station's bank; Pennine Radio in Bradford worried if it could pay its wages on an almost weekly basis, and LBC - the speech station for London and within which operated Independent Radio News (IRN), the sole supplier of national and international news for the whole 'network' - was so near to closing that the IBA had to agree to radical changes to its programming commitments. No ordinary business person would invest in such a sickly, unloved infant, which also faced a very slick and well-funded operation in BBC Radio 1. Not only THAT but the cretinous Musicians' Union conspired with the record companies to restrict the amount of 'recorded music' that could be played, on the basis that if vinyl could be played non-stop no-one would want to employ musicians or bother to buy records! A fantastically stupid and destructive approach which held back radio – BBC and commercial – for decades. Into this almost comically bad environment strode Jay, with his experience in a number of media businesses, and a determination – which borders on the heroic – to not only put his time, energy and (seemingly unlimited) enthusiasm into a last throw of the dice for ILR but to make 'his' station different from anything else ever heard in the UK. He achieved that – and much more – and, even more remarkably, he put the station in profit from day one and made a lot of money for its shareholders; something of which he was immensely proud and very keen to stress in our correspondence (more of which below). What was so different about Beacon? Well, there was the music for a start: hugely different from anything else on the dial from either the BBC or the other commercial (whoops! Sorry! 'Independent'-mustn't say 'commercial'; nasty, vulgar term!) services, which pretty well followed the Top 40 of the day, sprinkled with 'golden oldies'. Beacon played cool, west-coast U.S. rock, with two album tracks an hour. (Put not your faith in Wikipedia-the Beacon Radio entry claims it played 'Beautiful Music' – complete rubbish. Neither should you (of course) trust newspapers either; in a typically uninformed piece, the Wolverhampton Express and Star's news/obituary piece on Jay's death said it "played a mix of chart hits and golden oldies". No, that's what the OTHER stations were playing!). But there's more: the station boasted a U.S. originated station identification ('jingle') package unlike anything heard on a UK legal commercial station. Beacon had attitude, whereas most of the rest seemed determined to exist as a sort of BBC local radio with a bit more music but imbued with the same apologetic, half-embarrassed approach to anything that wasn't the Late Chemists' rota. There were a few notable exceptions, such as Piccadilly Radio in Manchester, which followed a Top 40 format to the fullest extent it could get away with, with ex- 'pirate' DJs and led by the former MD of 1960s 'pirate' Radio London; Capital Radio undoubtedly had glamour and star appeal, including the all-time great Kenny Everett – who also did a syndicated show tailored for Beacon Radio. But, overall, it was pretty tame fare and disappointing for anyone who had heard commercial radio in North America, Australia or practically anywhere else. There's an old saying in commercial radio that it is how you do the small things that make the difference. At Beacon practically every syllable, every second, was considered. Not just what you say, but how you say it; how you go into commercials and come out of them; when exactly in the hour you play certain categories of music and when you play several back to back. This is common now but in the mid-1970s it was a revolution. Woe betide any presenter who 'broke the format'. But every aspect of the station had been thought through carefully to be effective and derive maximum value for money. The design of the station's studios and offices – in a beautiful house in one of the leafier parts of Wolverhampton – had both atmosphere and ergonomic efficiency. Everything worked – unlike the rest of Britain. Processing of the signal gave it a gutsy sound – again, completely commonplace now, but frowned on then by the IBA engineers who insisted on a level of supposed audio 'quality' and sound-proofing of studios appropriate for Radio 3 rather than a local commercial station, but who seemed content with a weak, mincing signal from its transmitters (which they, rather than the stations, owned and operated). Although for some time I was the youngest member of staff, it was a young team and whilst of course not everyone prospered and survived and there are always tensions and rivalries, my memories are of the place being tremendous fun and I certainly made good friends there and enjoyed countless hours – usually at the pub over the road - of convivial and sometimes earnest talk, leavened by lots of after-hours drinking and much laughter. This often involved Jay. 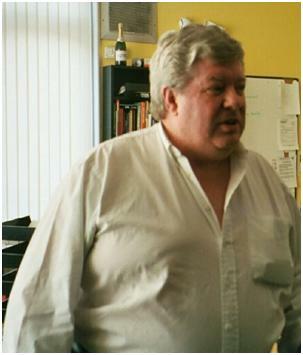 Naturally, as he was the MD, and I was low down the food chain, I treated him with due respect but I wouldn't say I was intimidated by him – it's hard to be intimidated by someone, however large in physique and status, if you hear him screaming onto the mic' "Keep bopping with Beacon!" In any event, he was always perfectly friendly towards me. I wouldn't want to build up my part though. By the time I arrived the Jay Oliver period at the station –and with it much of the station's distinctiveness, energy and excitement – was drawing to a close, although of course I didn't know it at the time. As is mostly with the case, the end came suddenly and unexpectedly. One day we were called into the board-room and told bluntly that both Jay and Allen had left the station. No questions, please. Just get on with your jobs, etc. But why did it happen? As I've indicated, the IBA didn't like Beacon. They reckoned, disdainfully, that "it followed the letter of the law but not its spirit" . And there seems to have been pressure put on the rest of the board to ditch both the MD and PD and install a more pliant and 'traditional' team in the top management. I say 'seem' because the full circumstances are disputed and controversial. More on that below. In the summer of 2002 Jay, via various former members of the original team - not least Phil Brice - contacted many of the '70s team and suggested a reunion. Jay threw himself into this with characteristic vigour. No detail was too small for him. The venue – a Wolverhampton hotel close to the station – was booked; he negotiated a (naturally!) good rate for those staying for two nights; menus were dispatched – and all this from Florida! 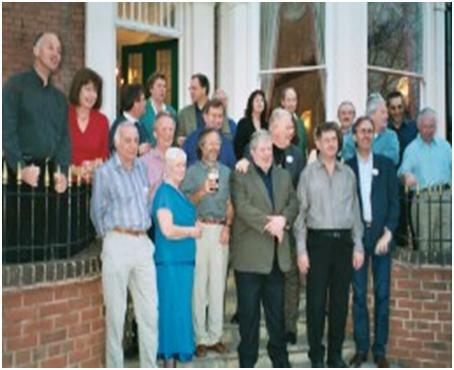 The reunion – in April 2003 – was a blast. 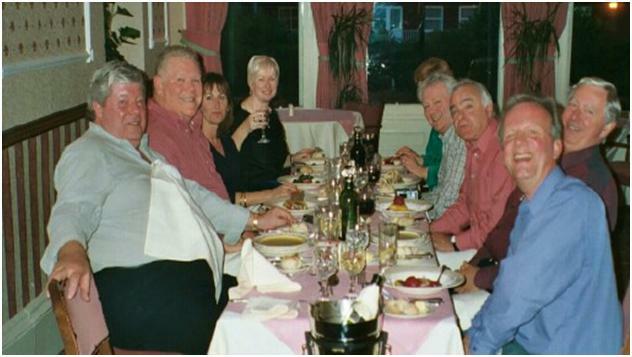 A small number of us were there on the Friday night and enjoyed a lovely meal (see picture – Jay is left, nearest the camera, Allen Mackenzie next to him; I am closest to the camera). The following day we had a tour of the 'modern' Beacon Radio. Now you say you should never go back, and there is some wisdom in that. Of course, the place felt and looked completely different. Most noticeable, aside from the technological changes, was the lack of staff. Saturday afternoon in '70s Beacon was an exciting place: people rushing around with teleprinter results and bits of tape, whilst the studio and control areas were frenetic as reporters and commentators filed their stories and 'phoned in results and sent interviews 'down the line'. And the newsroom was still staffed right through until midnight! In 2003, Beacon – which had long been taken over by the GWR group (the Stepford Wives of commercial radio; "we'll find out exactly what you most like and get rid of anything you might not like, then just give it you, whenever you want it: "how's that for you, big boy? That feel good?") and turned into another dreary clone, all following the same playlists and promotions; total lack of charisma, energy or originality. One person was running three services. This guy talked about once every 20 minutes, then pushed a button for the next pre-determined sequence of commercials and music. "A monkey could do this, couldn't they?" he mournfully suggested. Yes, and a computer could probably do it better than that – the realisation of which by the ever cost-cutting management eventually finished off most of remaining live and local presentation. Hideous! There were physical changes, too – this brilliantly designed complex had undergone some major alterations, which is natural I suppose, but Jay was horrified: "What have they done to our station?" he cried out several times. 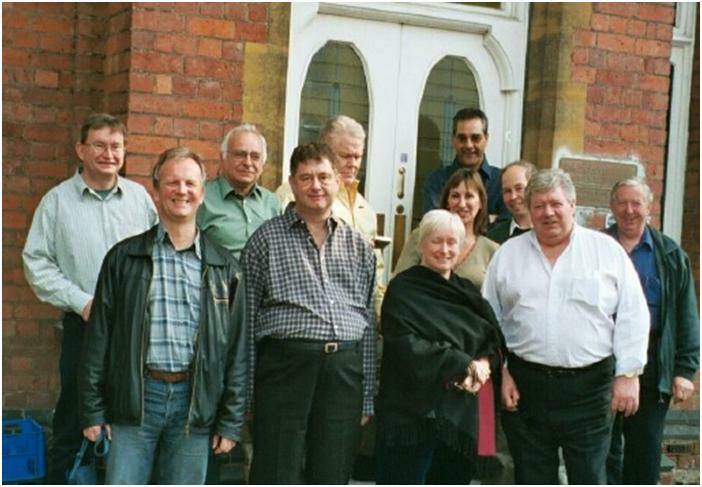 (Pictured Jay, front right, me front left, outside the station). Whilst this was going on, the main lounge area of the hotel was being festooned with memorabilia of many varieties in preparation for the big night. Many more arrived for this-including, gratifyingly, many of the news team - including my former boss, News Editor Mike Stewart, who achieved great success in running his own station(s) in East Anglia, Andrew Simmons (by then BBC) and Peter Brookes (then MUTV, now a lecturer in journalism at Staffordshire University). Whilst it was still light, we gathered outside for the 'group photo'. 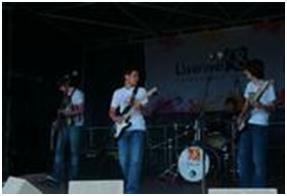 (Pictured, Jay taking his rightful place at the front). Later, there was a 'highlights tape', speeches and lots of shared memories. As it approached midnight, the hotel owner –in a scene that could have been straight from Fawlty Towers - insisted that we could not drink any more in the public areas of his hotel. The fact that folks had travelled far and wide - not just in the UK but from the USA, Canada and Australia, amongst others - cut no ice (in fact, there wasn't any ice, either!). So we repaired to Allen Mackenzie's room, just about squeezing everyone in (I actually sat at Allen's feet!). We talked to gone 3 a.m., I think. Jay was obviously very moved by it all. Naturally, a week or so later, I e-mailed him back in the 'States to thank him – for what he did in the 1970s and for the reunion, of course. After the usual exchange of pleasantries I got another rather different message from him. He had been checking up on me, he said. And he liked what he heard. (Modesty forbids further details but suffice it to say I was mightily chuffed to read it, especially as it came from Jay). I was obviously interested in the history of the station and commercial radio – true. Could we do a book together? He wanted to tell the whole, unvarnished truth about the station. He had in mind something in the same style as a book about David Crosby, in which the author/journalist had gone through various stories, rumours, etc. and allowed Crosby to explain in his own words what had 'really' happened. I was keen- and flattered of course – but I had to point out that such a book would require extensive research and would have to be very solid legally. Much of the story, as he indicated to me, could provide problems in that department and, rather touchingly, I think he had forgotten about the UK's libel laws: much more onerous than in his native country. We did correspond some more but for whatever reason(s) we didn't get any further than 'talking' about that book. Ironically, I am writing this surrounded by files and papers relating to the 'early' days of UK commercial radio, including Beacon, and I would love to do this book with Jay. Now, of course (and how often does this happen?) it is too late. Or maybe not. His untimely death has inspired me to do further work on this, just as Beacon Radio delighted and inspired me in my nascent radio career. Jay's funeral is being held tomorrow (August 15th) in Florida. Aside from all his other successful business ventures, his place as one of the 'greats' of UK commercial radio is assured. And without him, the mid-'70s in the English Midlands would have been a far duller and less joyful place. May he keep bopping somewhere, somehow.